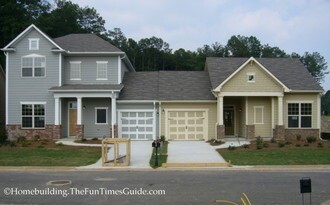 Multifamily Home Plan, Duplex Design, Townhome Plan, Townhouse Design, Paired Villas. Pick a name from the preceding list for what you see in the above photo I took recently at Hiram Park subdivision. No matter which you choose you must agree that they are craftsman-style designs. If you’re having a tough time making a choice of what to call them then join the club. Multifamily home plan sounds a little like a commune. Duplex design sounds cheap and these are not cheap. Duplex also brings to mind a regular ranch style home that’s basically two small apartments. Townhome (or townhouse) plan, to me, means a two story building with identical multiple units side-by-side with virtually the same roof line. Paired villas sounds like a slick marketing term…period…but it works. That’s just the way I see it from my past experience. You may see it totally different. That’s what makes this interesting. I think everyone is familiar with all of the terms I’ve mentioned with the possible exception of Paired Villas. Craftsman-style paired villas is the term that Ellen Bowman, agent on duty, applied to the style of homes in this neighborhood. My recent visit to Hiram Park subdivision, a David Weekley Homes development, had some surprises in store, some good and some not so good. 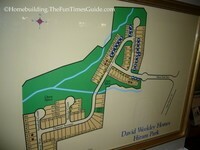 David Weekley Homes was the nation’s 20th largest homebuilder for 2005. David Weekley Homes is an award winning homebuilder many times over. * Unattractive Views (so far anyway). The views from the windows in the homes completed first are Horrible. Look out of your kitchen window and you see nothing but the siding of the attached home next door. The view from the rear windows is of a Huge stone wall. See the photos below. The homes that are under construction and the multitude of lots still available will offer much better views than the first few homes. If it had been me, I would have chosen to finish construction on homes that offered attractive views to compliment the homes.